Directions : enlarge thumbs by clicking mouse on images. 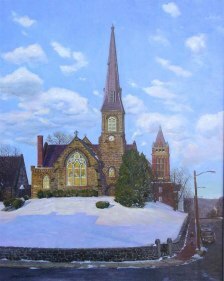 Updated 2/19 : "Here are some of my smaller recent works. 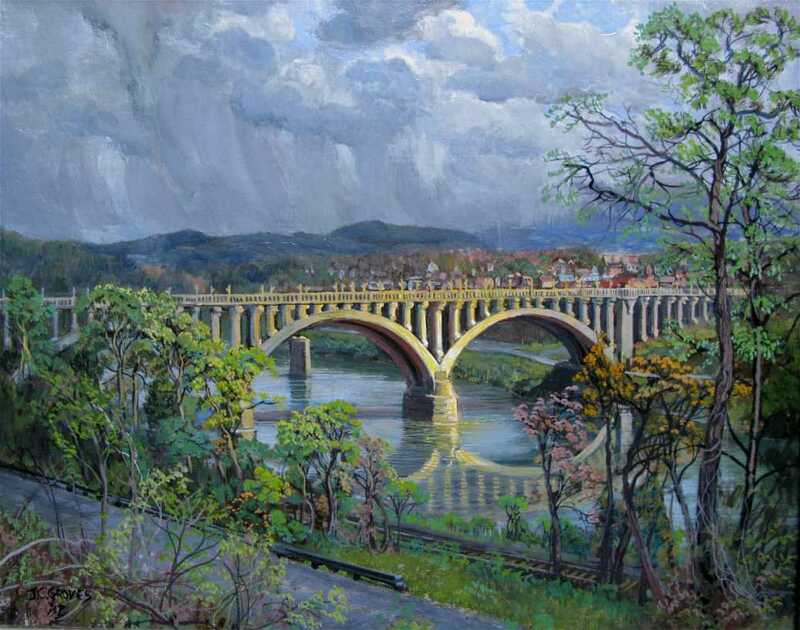 These paintings are oil on Canvas or panel. 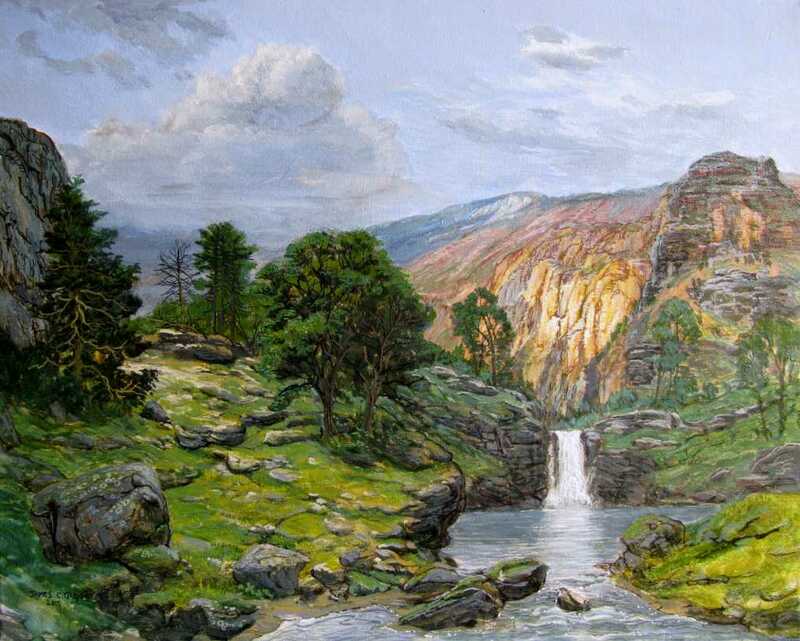 A few scenes were painted on site though most were created in my studio. My usual approach to composition is that of the grand landscape." Note: Western Maryland Gallery offers large and small giclees of some of the following works. Each giclee is printed on either 11"x15", or 22"x30" mold-made100% cotton watercolor paper. 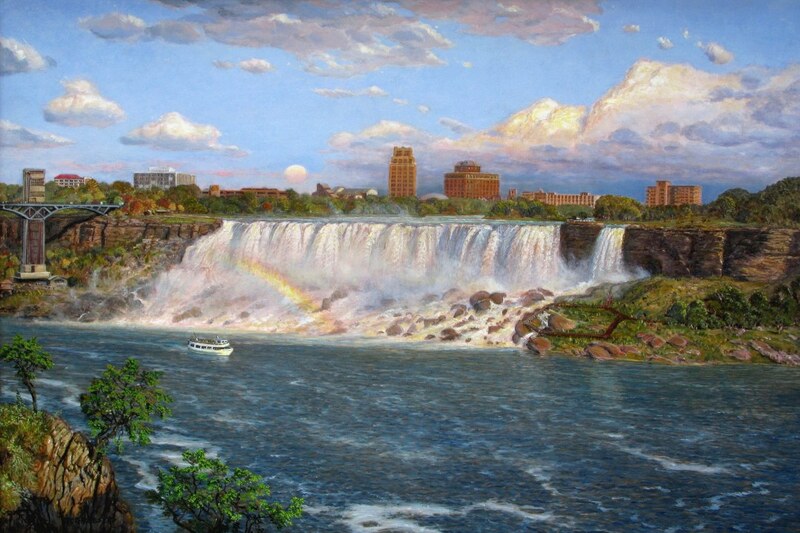 Sorry, no canvas prints. 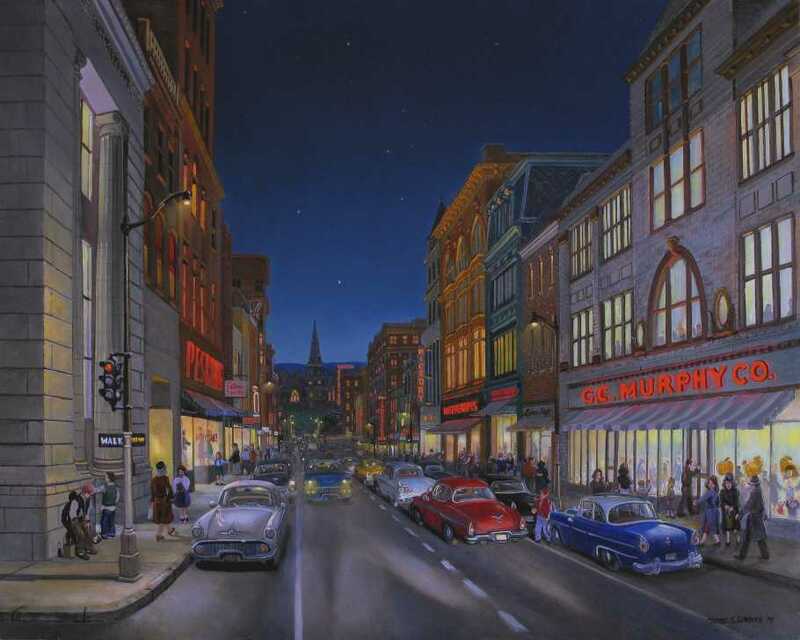 Respective image sizes are 9.5"x13" for the small giclee, and 18x24-inches for the large; price per giclee is $35 for the small and $90 for the large. Shipping is $10 . 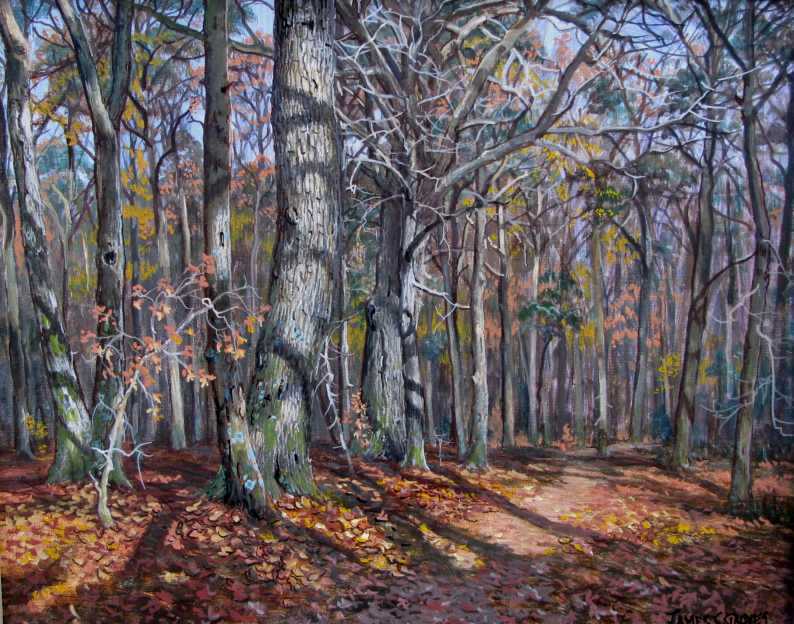 Order Giclee LTD Prints online or by phone. 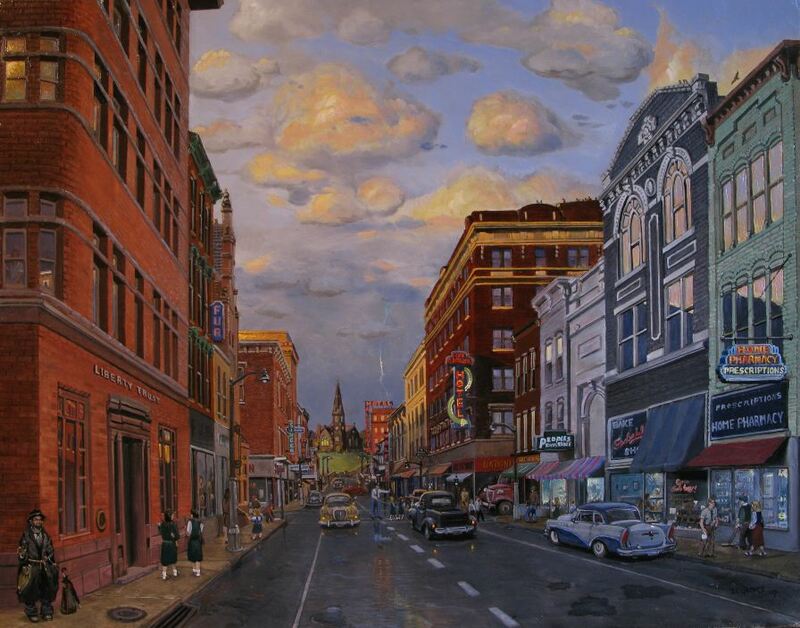 Western Maryland Gallery offers fast service. More info or help with your selction, just call us at 301-689-3389 Tuesday-through-Saturday; 9 AM to 5PM EST. 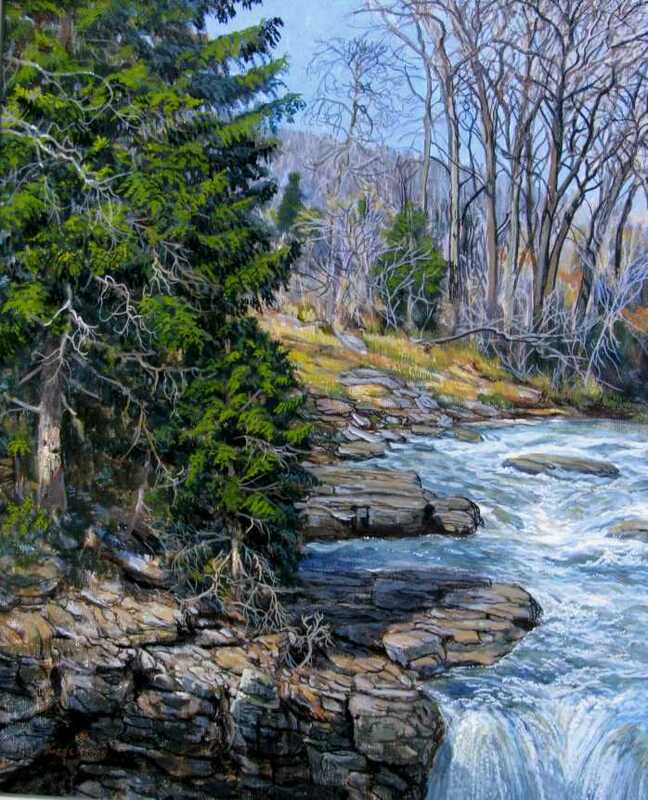 "Rain Shadow; Will's Creek wending the Cumberland Narrows"; Painted March of 2018. 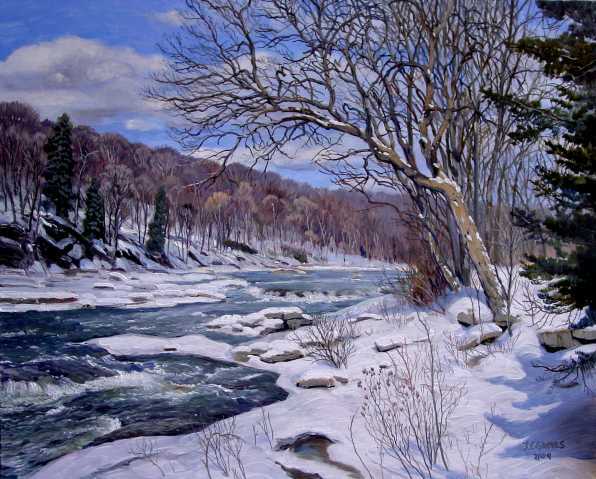 Original oil Painting on linen canvas by James C. Groves. 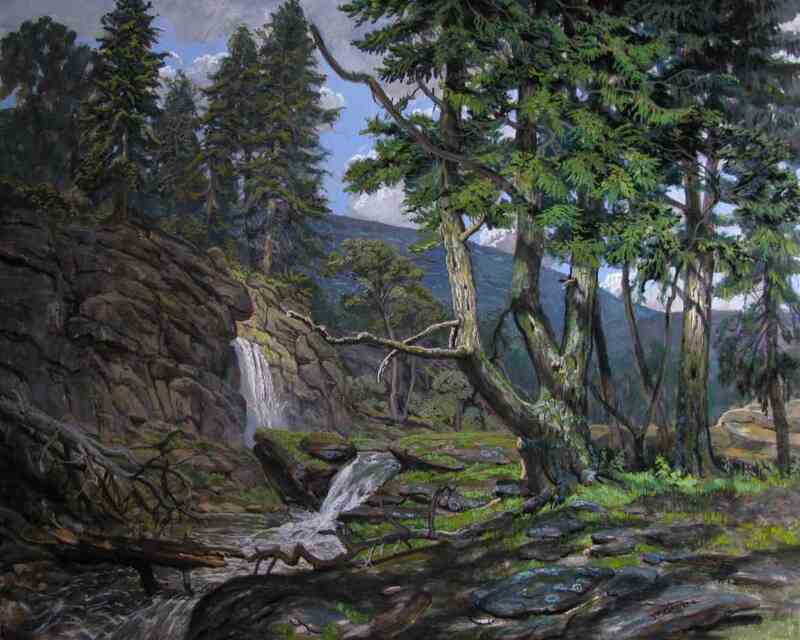 Painting measures 18x24-inches. 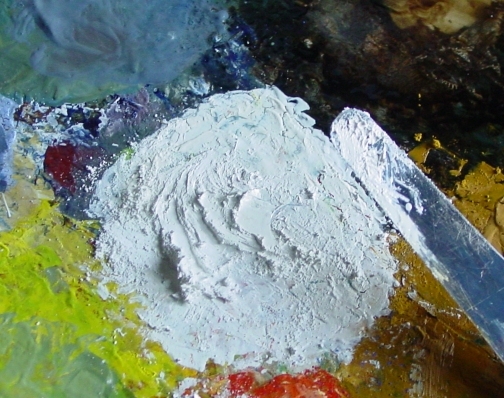 Pigments combined with Origin Congealed Varnish; then applied with a solvent. 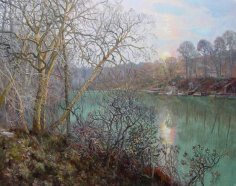 "Late Morning Light; Abandoned Quarry"; Painted February-March of 2018. 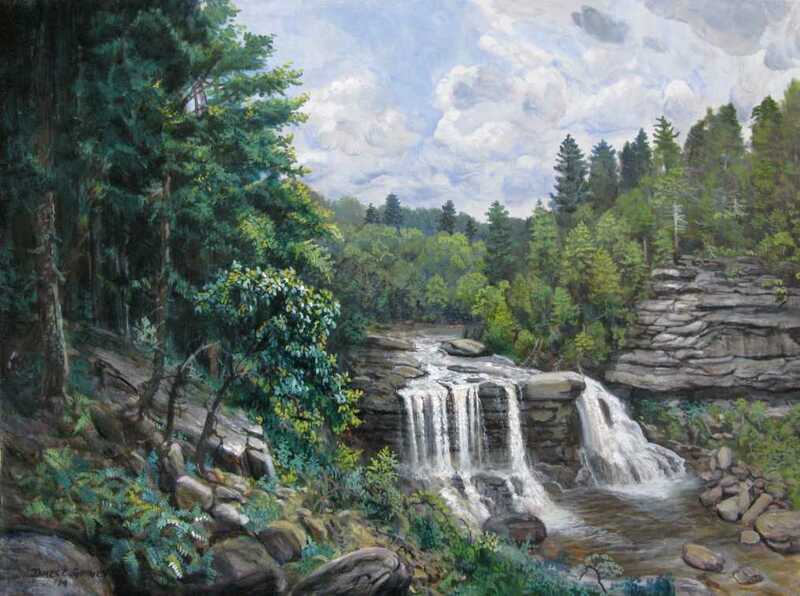 Original oil Painting on linen canvas by James C. Groves. 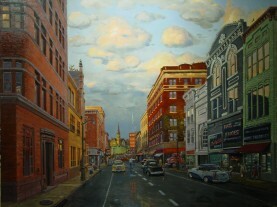 Painting measures 24x30-inches. 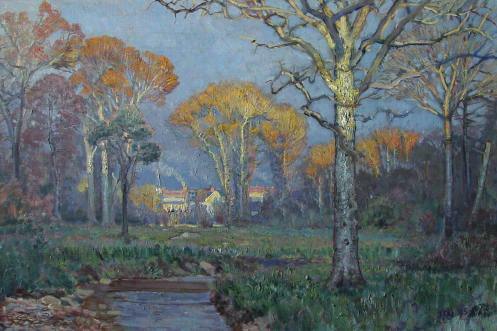 Pigments combined with Origin Congealed Varnish; Applied using spirits of turpentine. 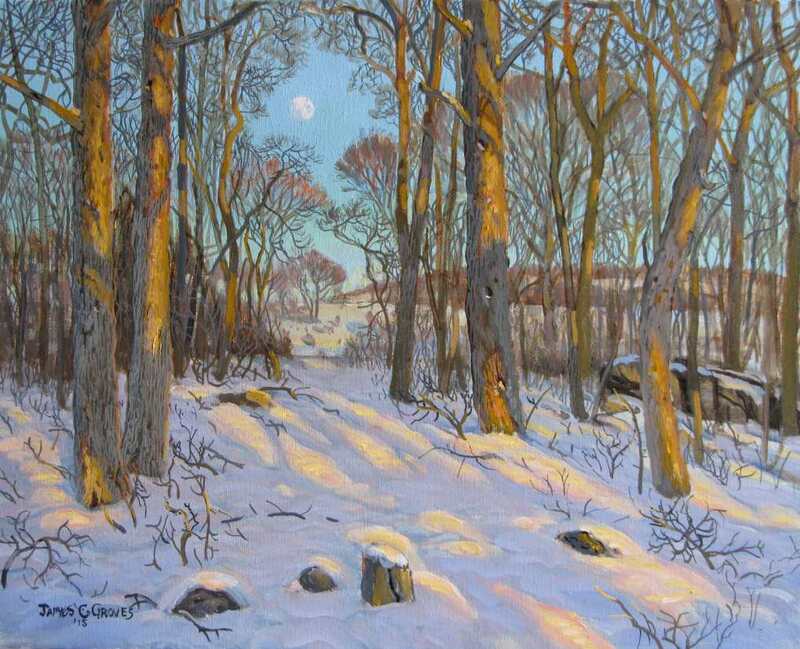 "Hunter's Moon"; Painted February of 2018. 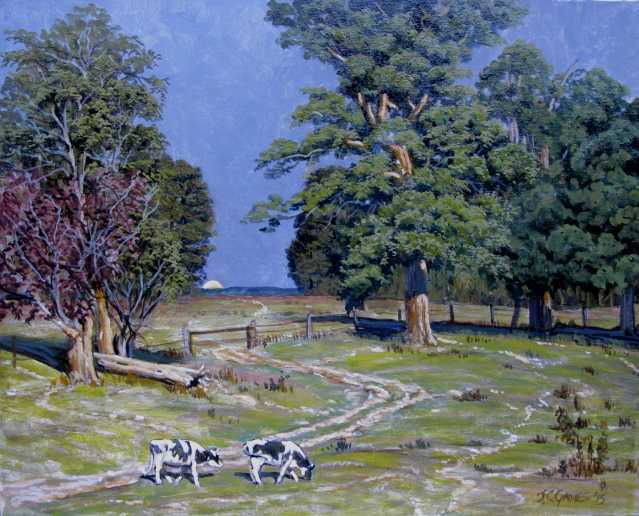 Original oil Painting on linen canvas by James C. Groves. 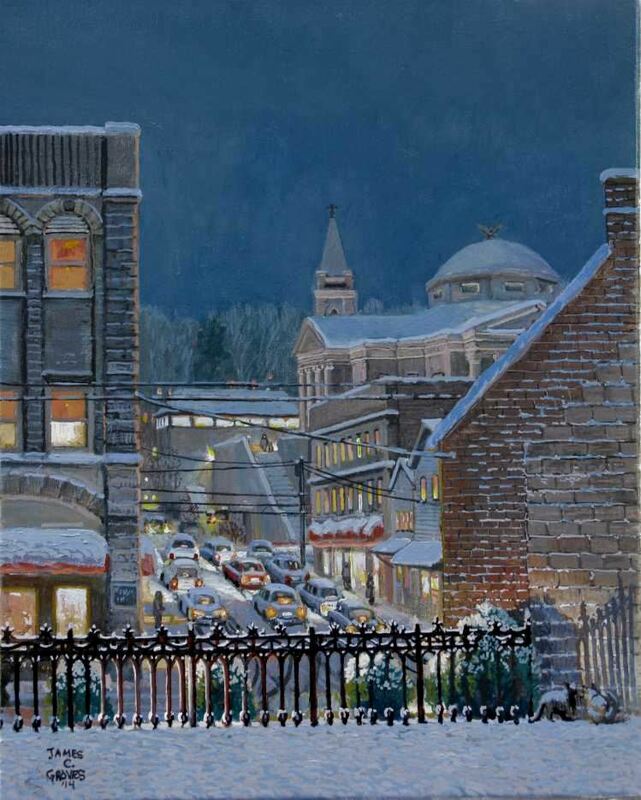 Painting measures 16 x 20-inches. 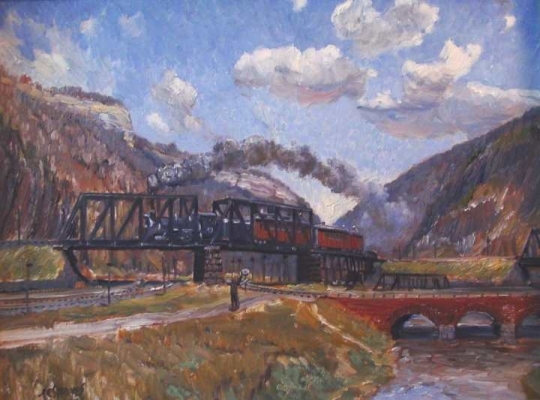 Pigments combined with Origin Congealed Varnish; Applied using spirits of turpentine. 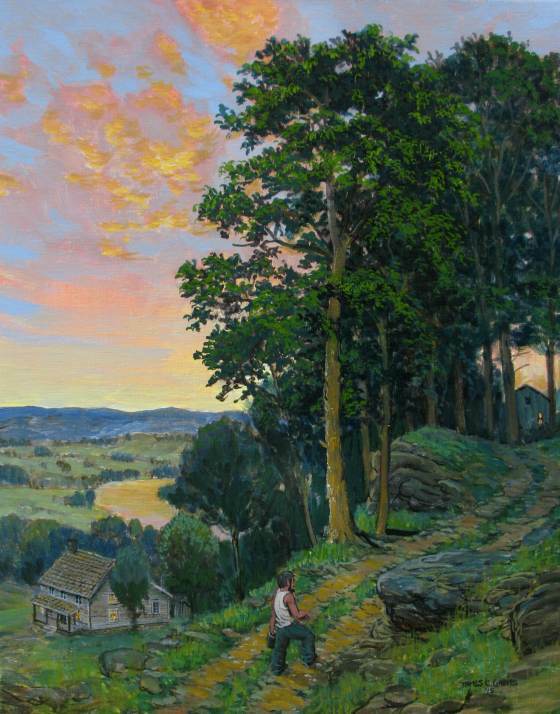 "August Evening"; Painted January of 2018. 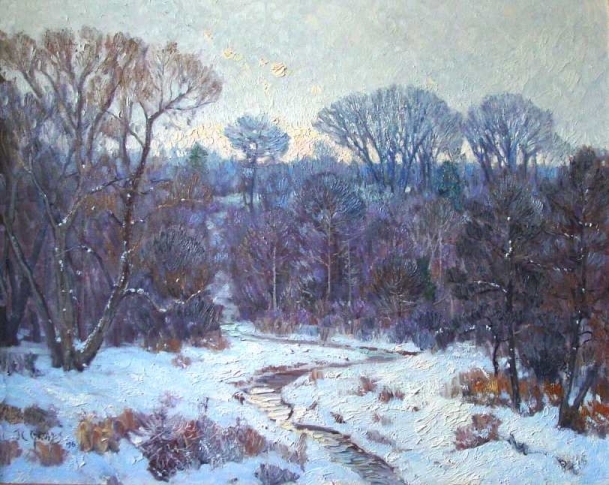 Original oil Painting on linen canvas by James C. Groves. 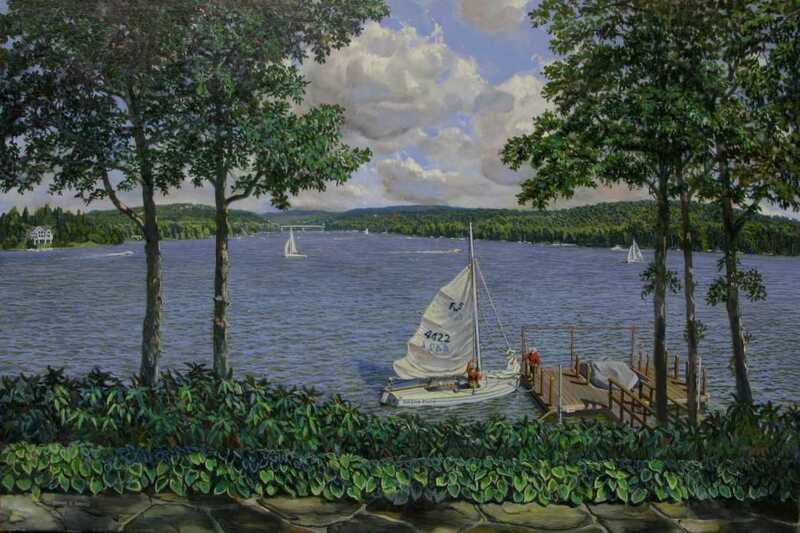 "Deep Creek lake of Garrett County, Maryland; Raising the Sail; July". Painted Sept-Oct of 2017. 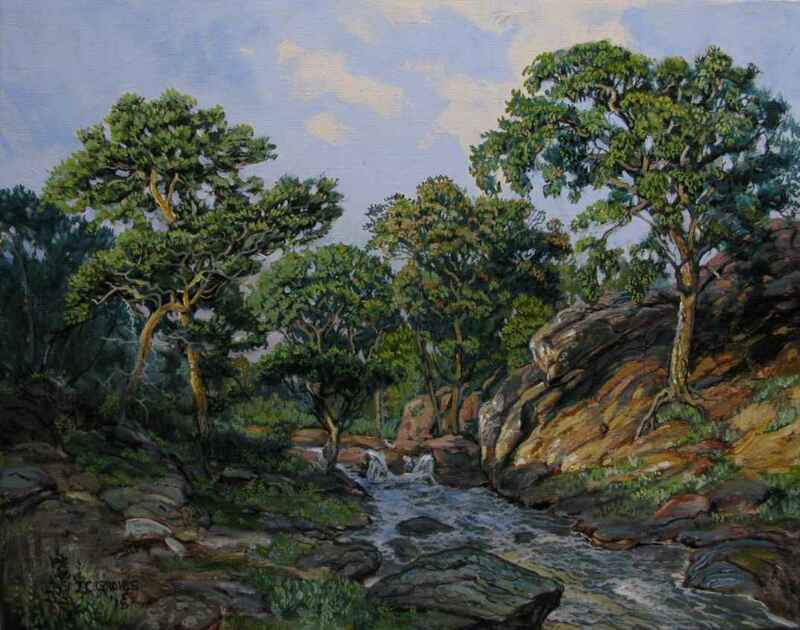 Original oil Painting by James C. Groves. 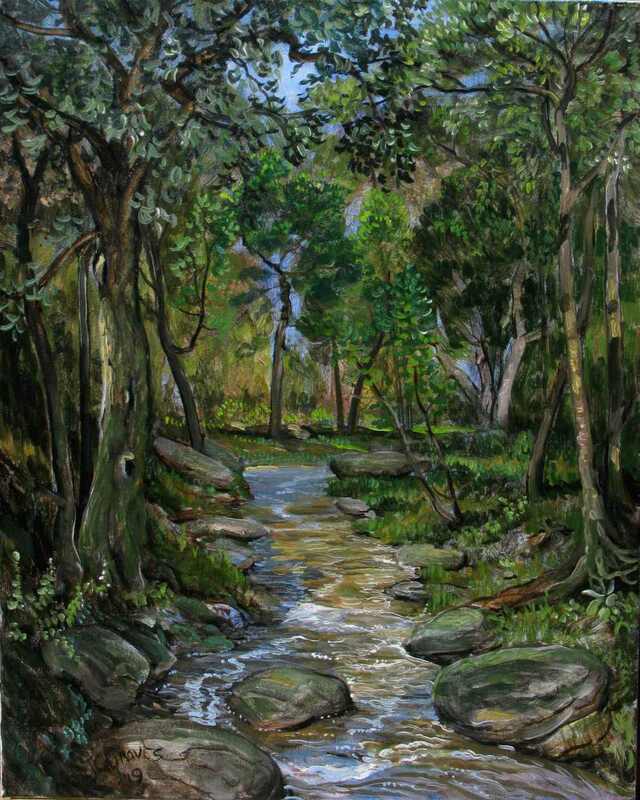 Painting measures 24x36-inches. Linen on stretcher: Pigments combined with Origin Congealed Varnish; Applied using spirit of turpentine. 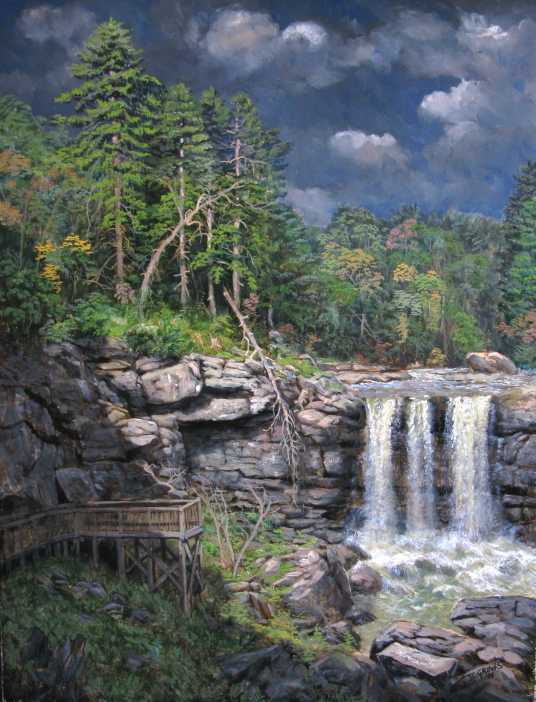 "Tygart River, West Virginia; Old Mill Race Carved-Out Above the Falls; July". Painted 2017. 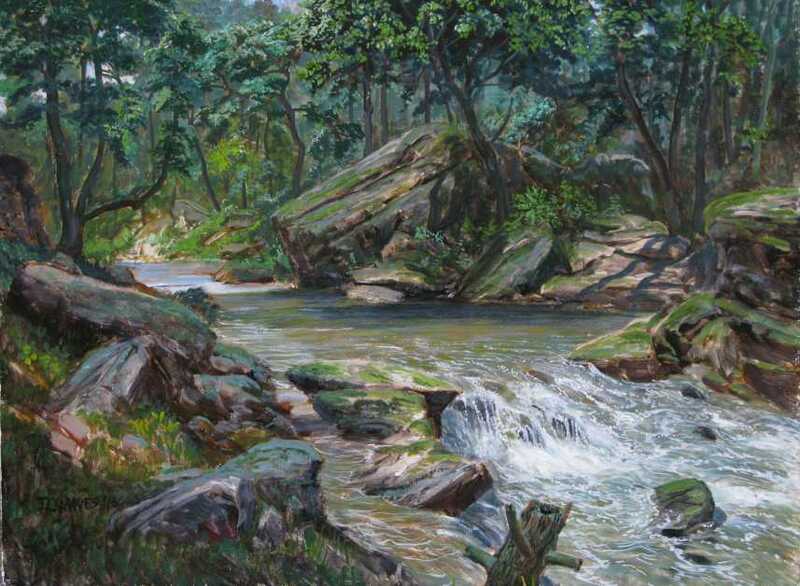 Original oil Painting by James C. Groves. 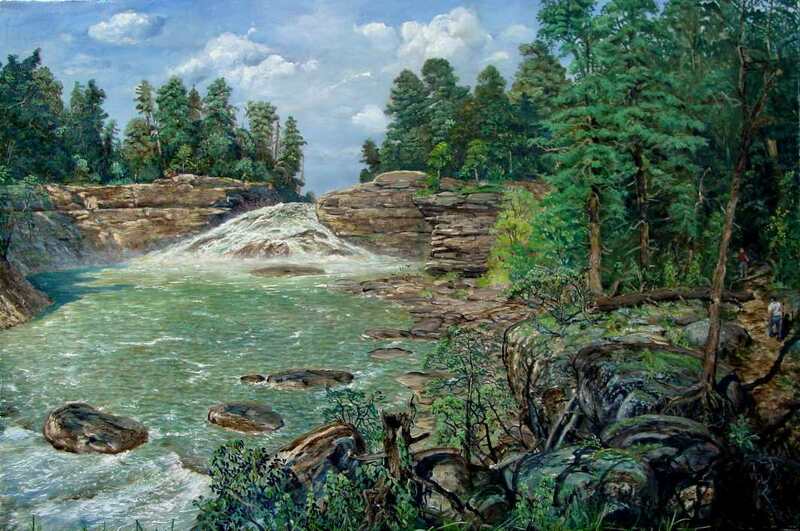 Painting measures 18x24-inches. Linen on stretcher: Pigments combined with Origin Congealed Varnish; Applied using spirit of turpentine. 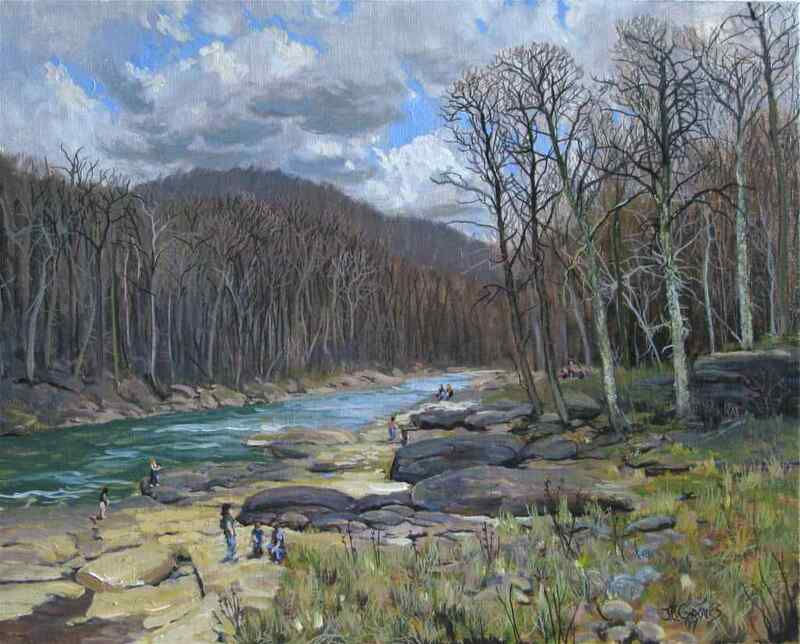 "Tygart River Gorge, West Virginia; Below the Falls; Late March". Painted 2017. 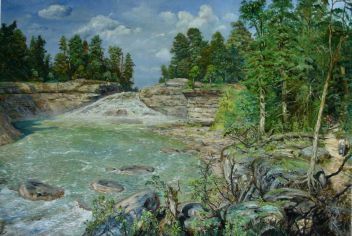 Original oil Painting by James C. Groves. 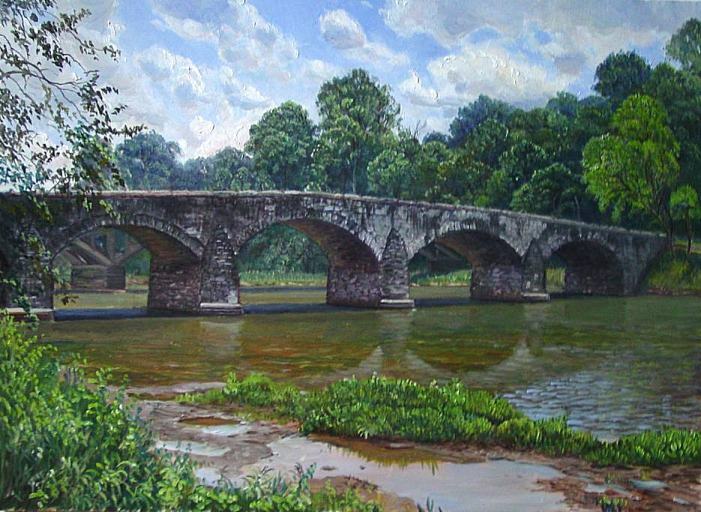 Painting measures 16x20-inches. 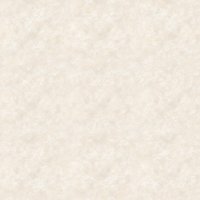 Linen on stretcher: Pigments combined with Copal Jelly; Applied using spirit of turpentine. 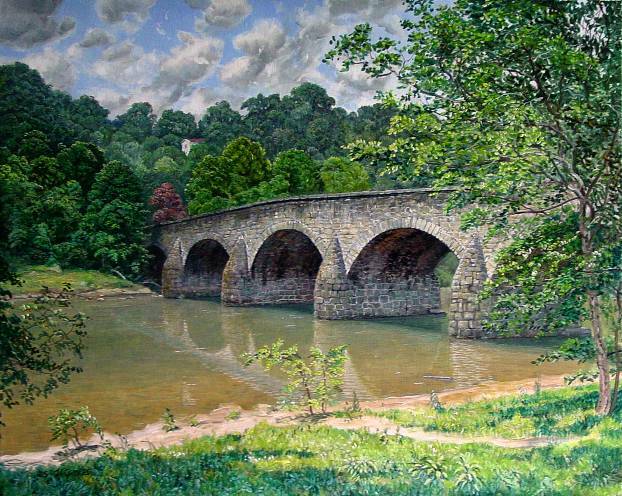 "Million Dollar Bridge; Fairmont, W.V. 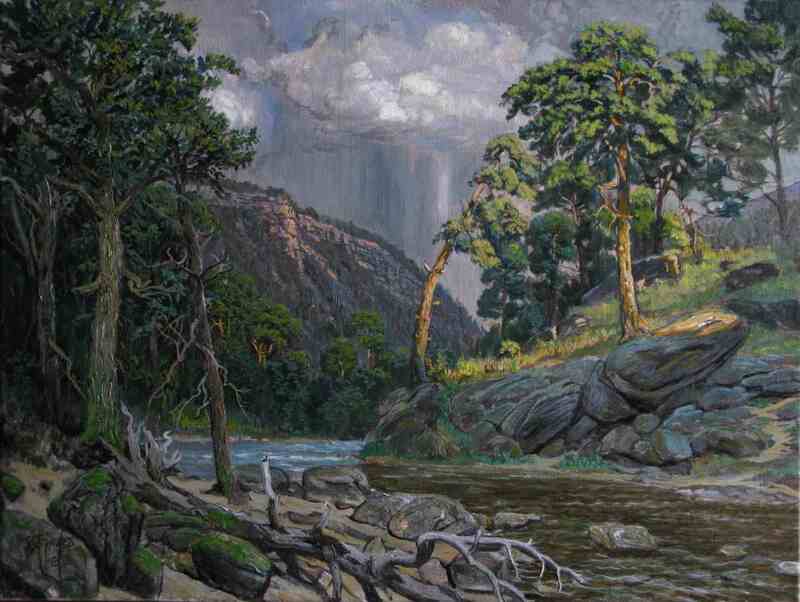 ; April Showers, 2017" Original oil Painting by James C. Groves. 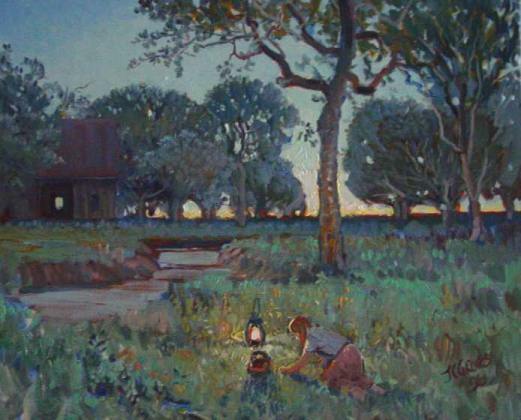 Painting measures 16x20-inches. 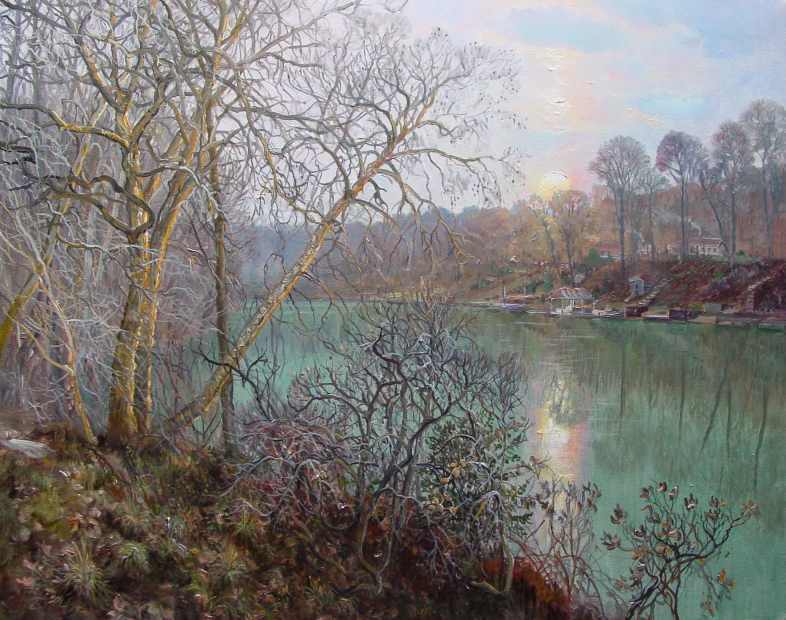 Canvas: Pigments combined with Origin Congealed Varnish; Applied using spirit of turpentine. 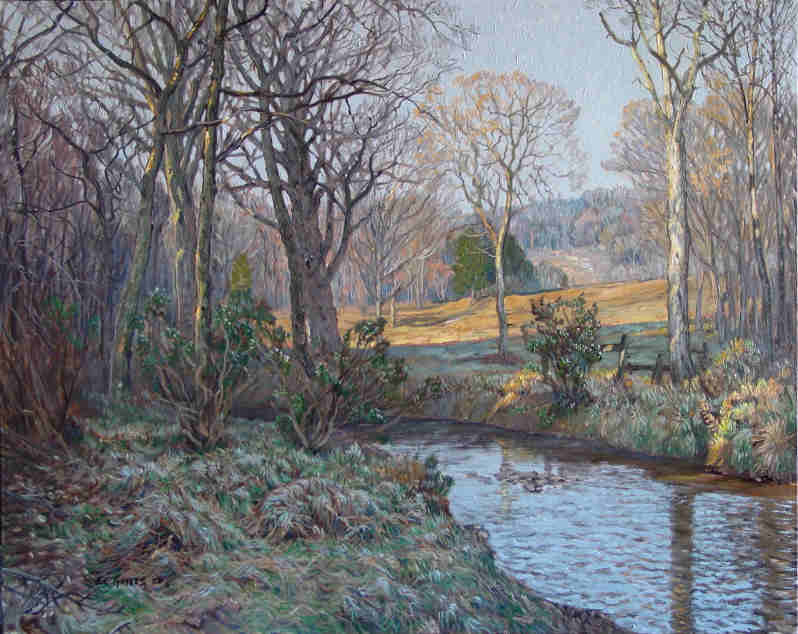 "Georges Creek; Cloak of Evening, March, 2017" Original oil Painting by James C. Groves. Painting measures 16x20-inches. Canvas-on-panel: Pigments combined with Origin Congealed Varnish; Applied using spirit of turpentine. 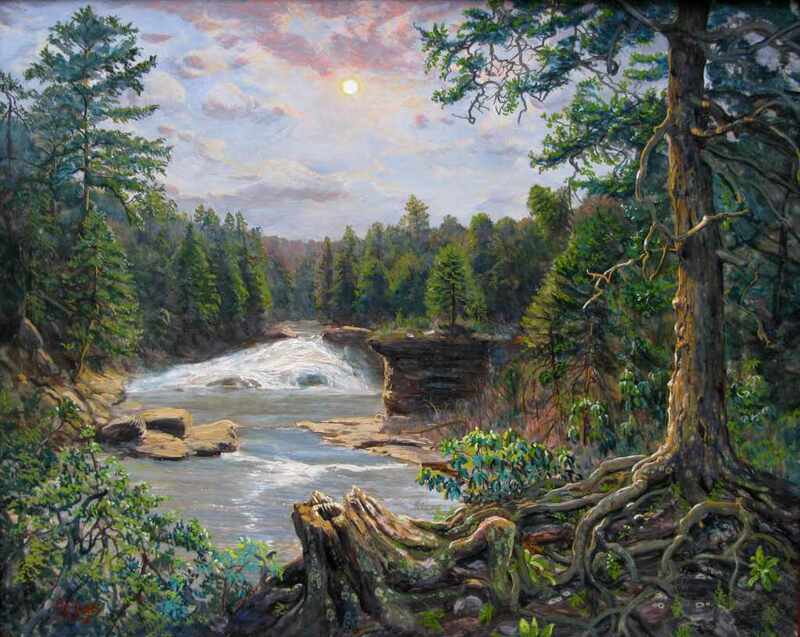 "Canaan River Gorge; End of Indian Summer, October, 2016" Original oil Painting by James C. Groves. 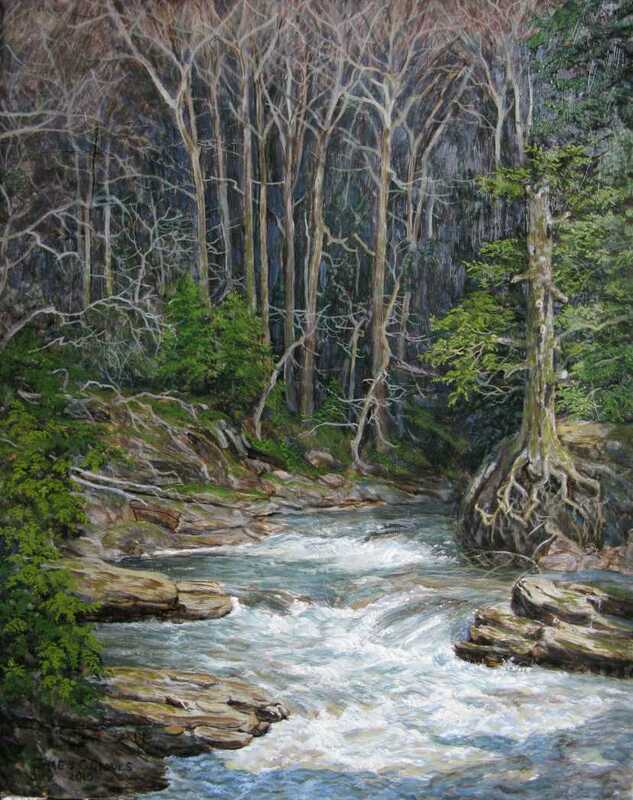 Paintinge is 18x24-inches, canvas-on-stretcher: Pigments rubbed-up stiffly with heat-processed nut oil, then dosed with Copal Jelly; Applied using spirit of turpentine. 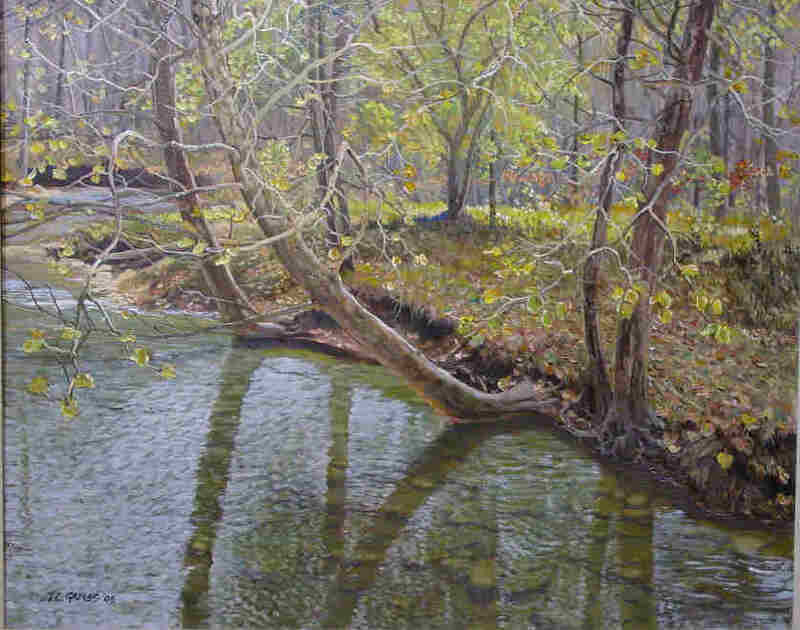 "Savage River, Garrett County, MD; Trout Pool and Shade, October, 2016" Original oil Painting by James C. Groves. 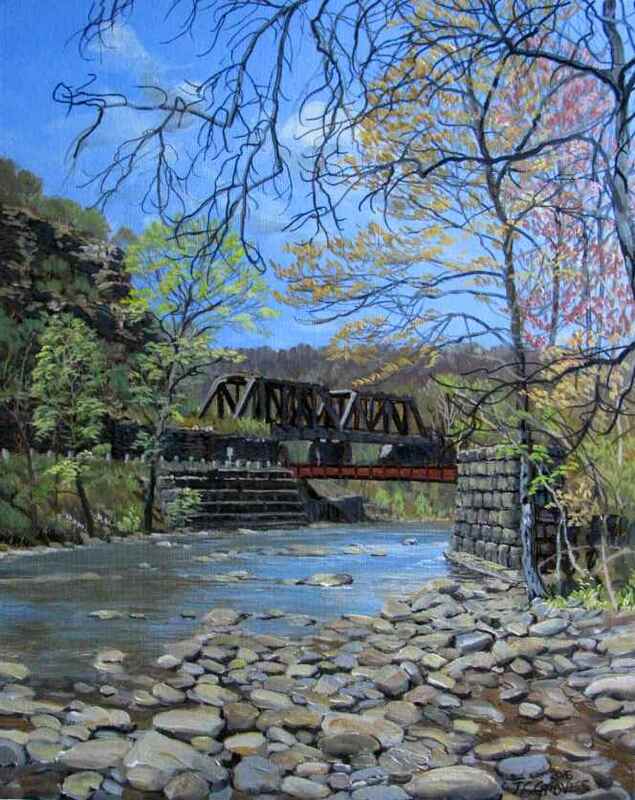 "Wills Creek Through the Narrows, Spring; Looking West; April, 2016" Original oil Painting by James C. Groves. 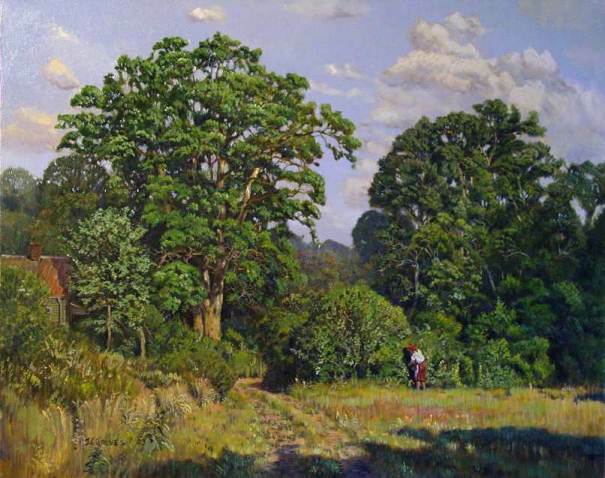 Paintinge is 16x20-inches, canvas-on-panel: Pigments ground stiffly with heat-processed linseed oil, then dosed with Origin Congealed Varnish; Applied using spirit of turpentine..
"Mid-Morning Sun; Green of May" Original oil Painting by James C. Groves. Completed May, 2016; Size is 16x20-inches, canvas-on-panel: Pigments ground with heat-processed linseed oil then dosed with Cole's Copal Varnish; paint applied using spirit of turpentine..
No prints available; Price: $625. Unframed. Shipping within continental US: $12.00. [Total cost w/shipping is $637.00] International orders willrequire additional shipment charges. 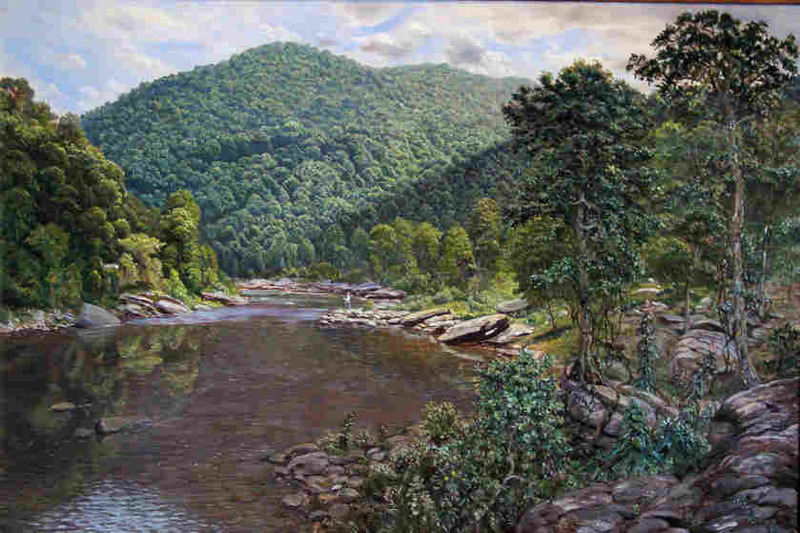 "Sun-Bath; Cliffside Across the River from Enterprise, WV" Original oil Painting by James C. Groves. Completed April 9th, 2016; Size is 16x20-inches, canvas-on-panel: Pigments ground with ORIGIN Congealed Varnish; application using spirit of turpentine. .
"Embers of the Day; February; the Oncoming Cold Front" Original oil Painting by James C. Groves. 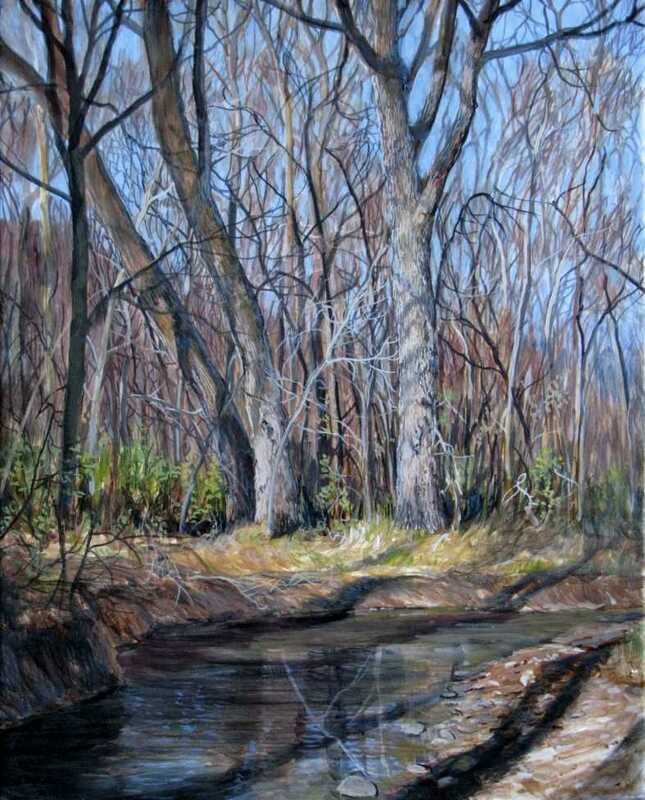 Completed March 3rd, 2016:: Size 16x20-inches on canvas-on-panel: Pigments ground with ORIGIN Congealed Varnish; then applied using spirit of turpentine. .
"Gloam Upon the Willows and Oaks; January" Original oil Painting by James C. Groves. 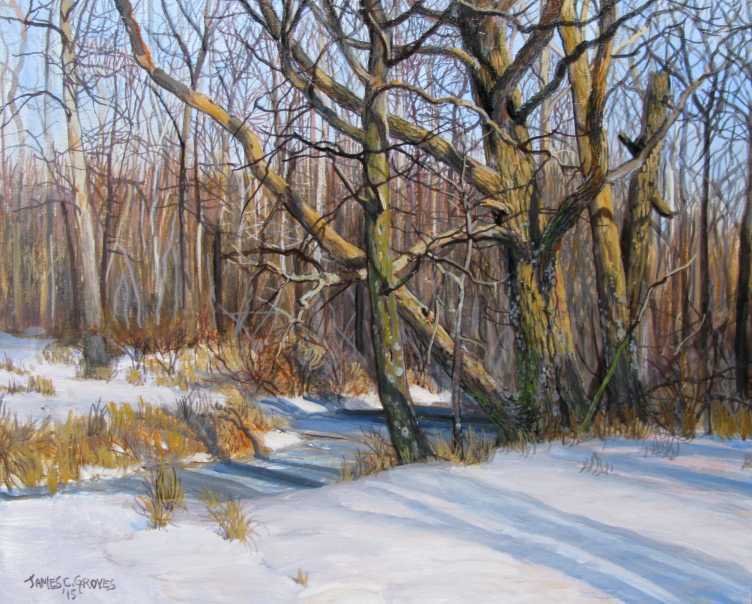 Completed January 18th, 2016:: Size 16x20-inches on canvas-on-panel: Pigments ground with ORIGIN Congealed Varnish; then applied using spirit of turpentine. .
"Imagined Snow; Georges Creek, December" Original oil Painting by James C. Groves. 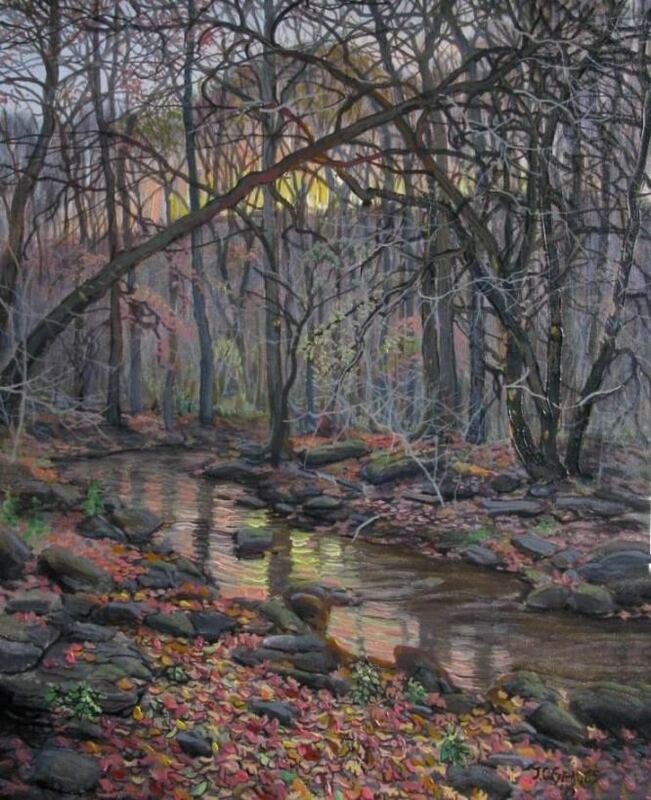 Completed December, 30th, 2015:: Size 16x20-inches on canvas-on-panel: Pigments ground with ORIGIN Congealed Varnish; then applied using spirit of turpentine. .
"Mid-Morning Light; November" Original oil Painting by James C. Groves. 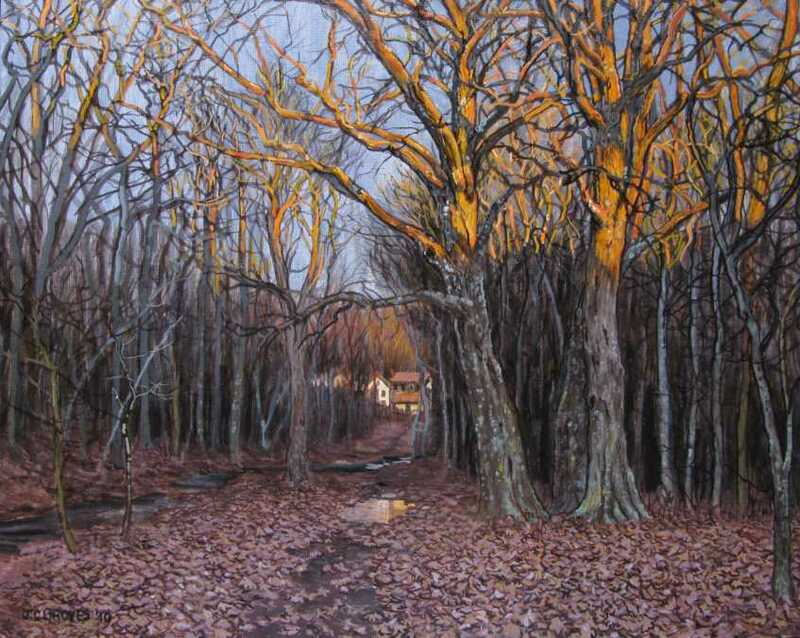 Completed December, 2015:: Size 16x20-inches on canvas-on-panel: Pigments ground with ORIGIN Congealed Varnish; then applied using spirit of turpentine. .
"The Exceptionally Mundane; Sand Run Twilight" Oil Painting by James C. Groves. 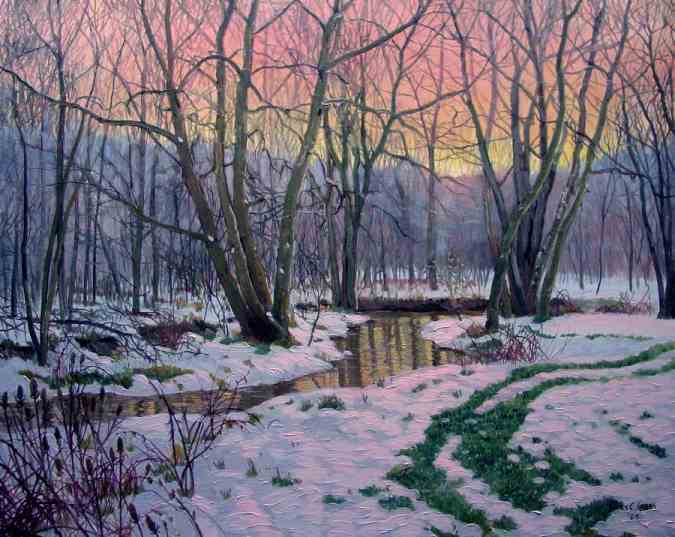 Completed November, 2015:: Size 16x20-inches on canvas-panel: Pigments ground with ORIGIN Congealed Varnish; then applied using spirit of turpentine. .
"Towards the End; Sundown" Oil Painting by James C. Groves. 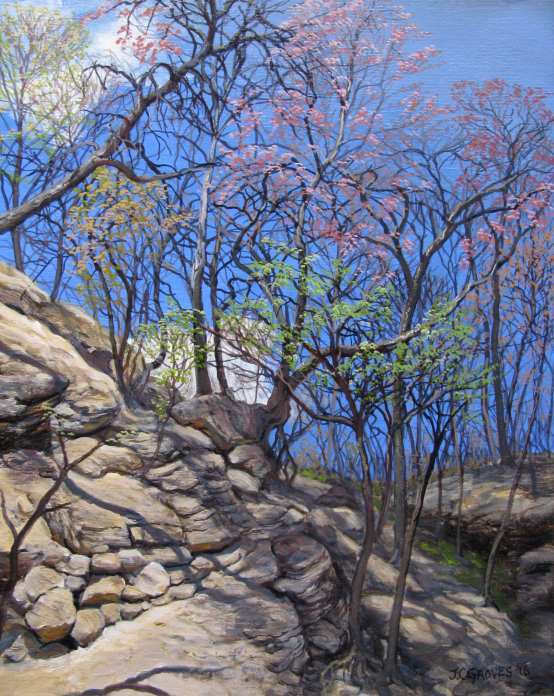 Completed October, 2015:: Size24x30-inches on canvas-panel: Pigments ground with ORIGIN Congealed Varnish; then applied using spirit of turpentine. .
"Oak Of A Thousand Moons; Garrett County, MD." 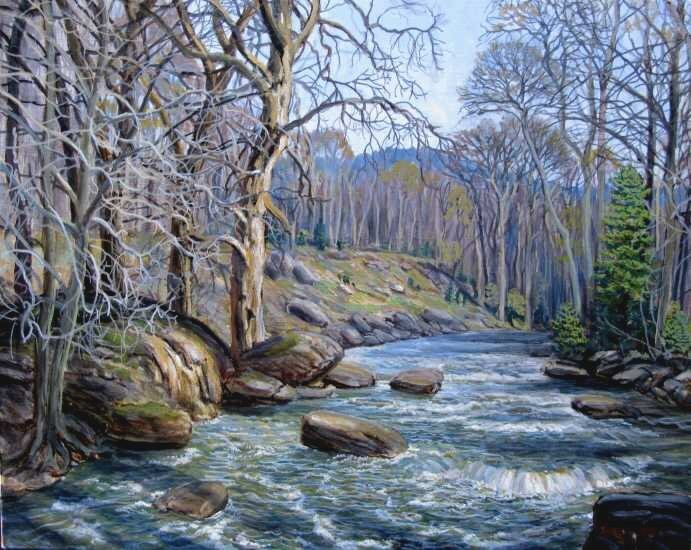 Oil Painting by James C. Groves. Completed September, 2015:: Size16x20-inches on canvas: Pigments ground with ORIGIN Congealed Varnish; then applied using spirit of turpentine. 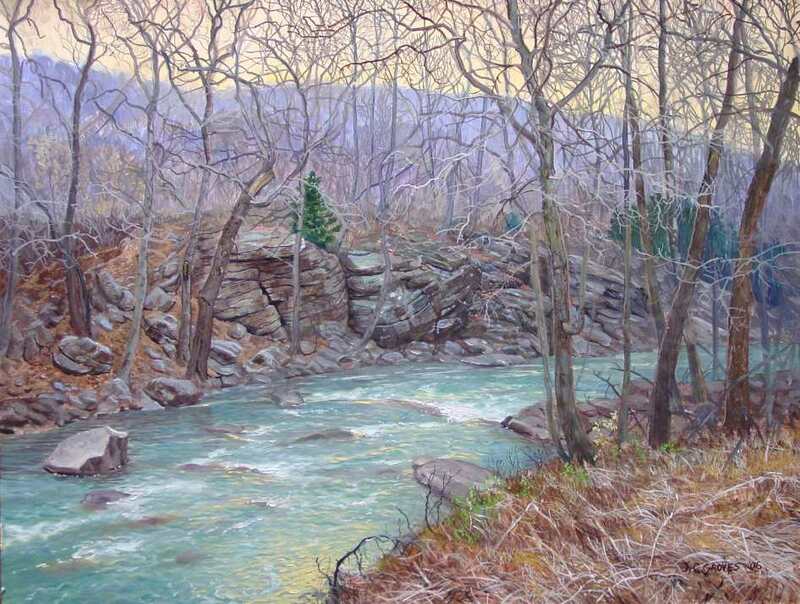 "Warm Up, April Afternoon: Decker Creek Near Masontown, WV" Oil Painting by James C. Groves. Completed July, 2015:: Size16x20-inches on canvas: Pigments ground with ORIGIN Congealed Varnish; then applied using spirit of turpentine. 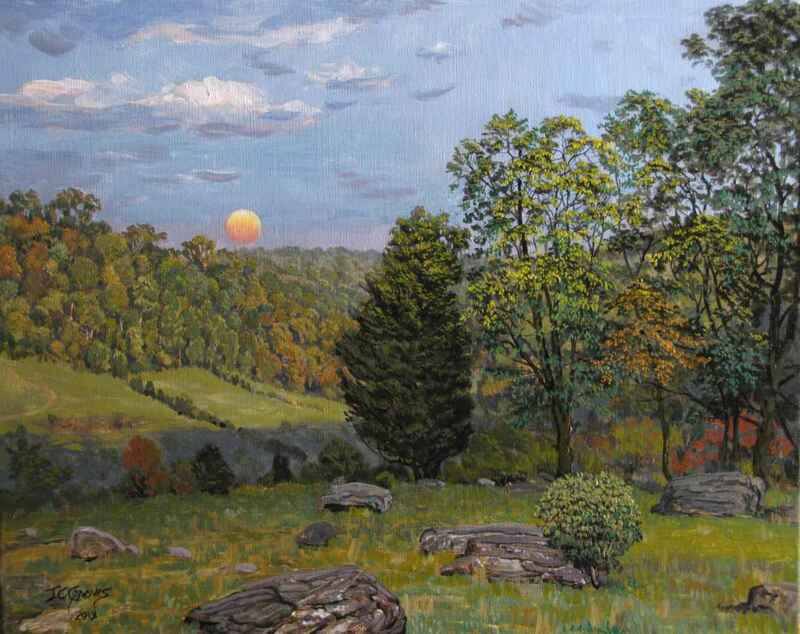 "The Fade of Day" Oil Painting by James C. Groves. 2015, June:: Size16x20-inches on canvas: Pigments ground with ORIGIN Congealed Varnish; then applied using spirit of turpentine. 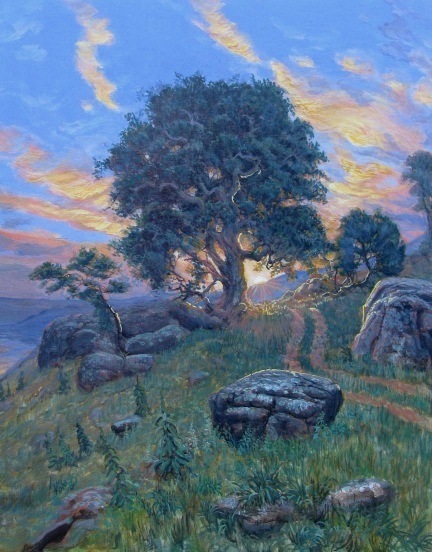 "Renewal" Oil Painting by James C. Groves. 2015, May: Size16x20-inches on canvas: Pigments ground with ORIGIN Congealed Varnish; solvent technique. 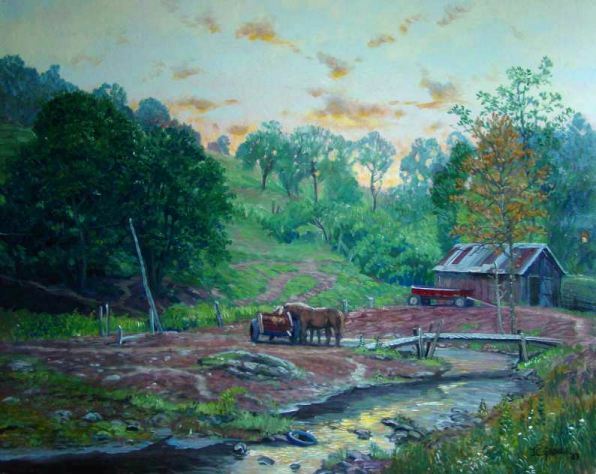 "Spring Morning; Decker Creek along Route 7, near Masontown, West Virginia" Oil Painting by James C. Groves. 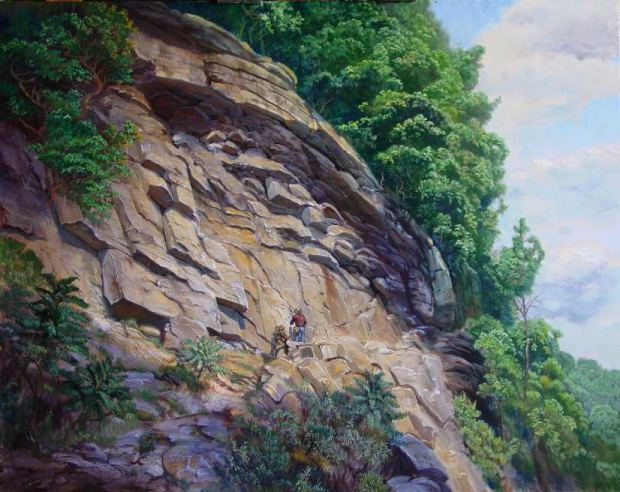 "Late Morning: Old Sandstone Quarry" Painting by James C. Groves. 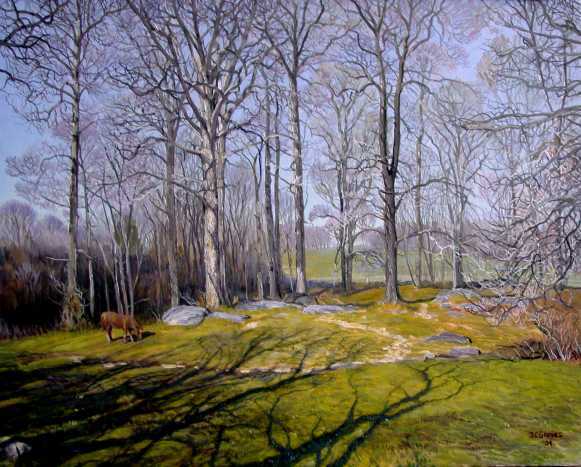 2015, April: Size16x20-inches on canvas: Pigments ground with ORIGIN Congealed Varnish; solvent technique. 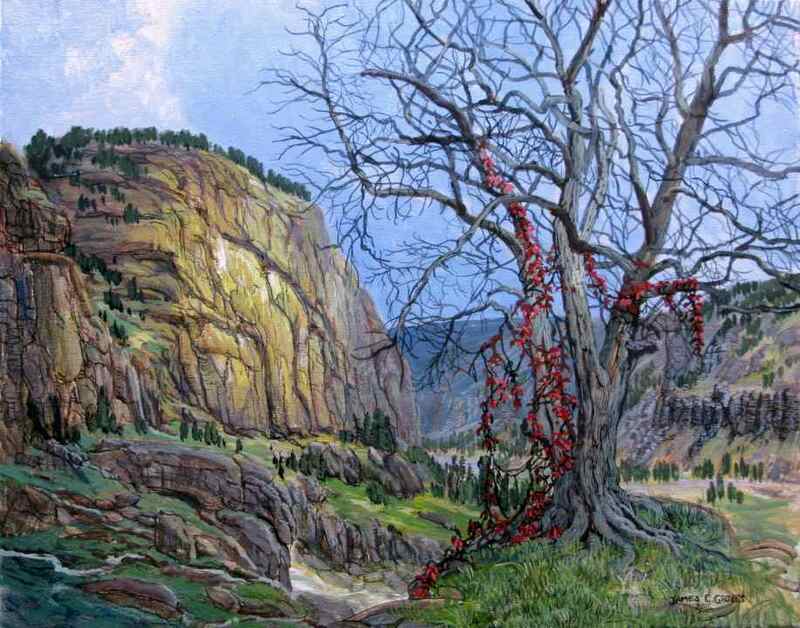 "Blackwater Canyon; Late March" Painting by James C. Groves. 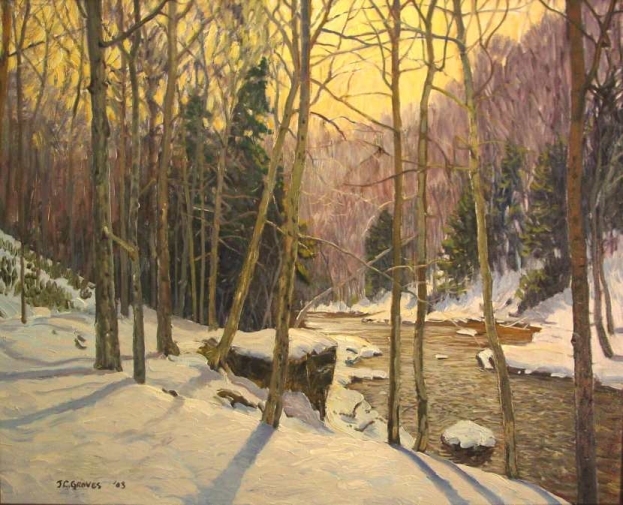 "Late Afternoon Along Georges Creek; November" Painting by James C. Groves. 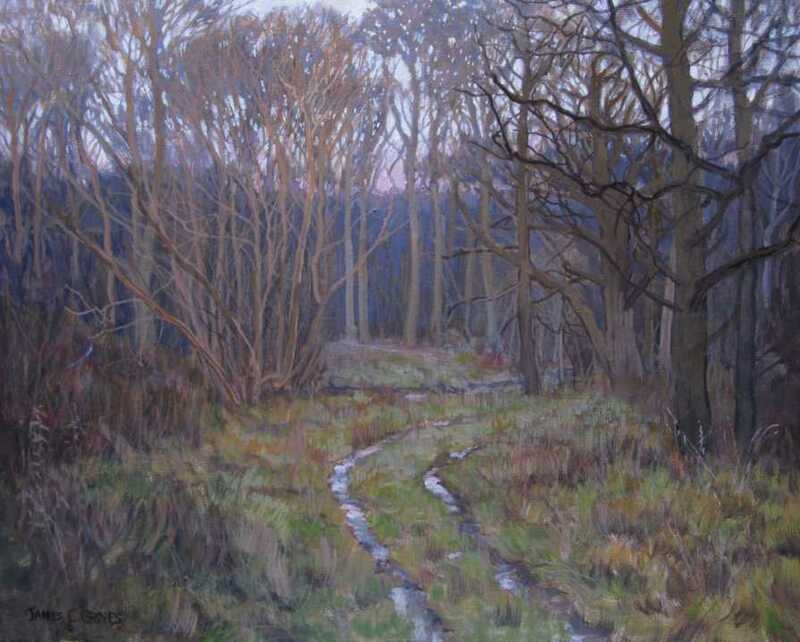 2015, February: Size16x20-inches on canvas: Pigments ground with ORIGIN Congealed Varnish; solvent technique. 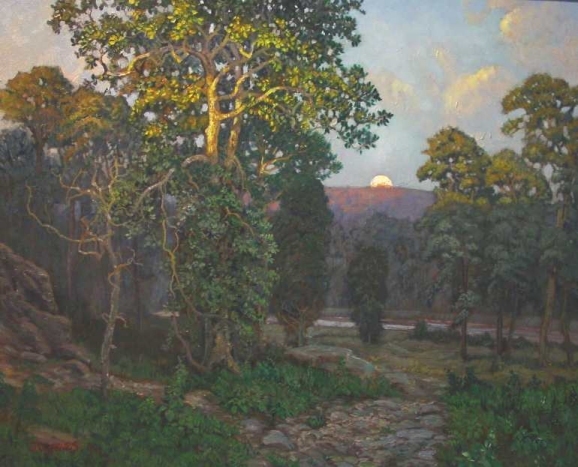 "Moonrise with Sunset; January Evening" Painting by James C. Groves. 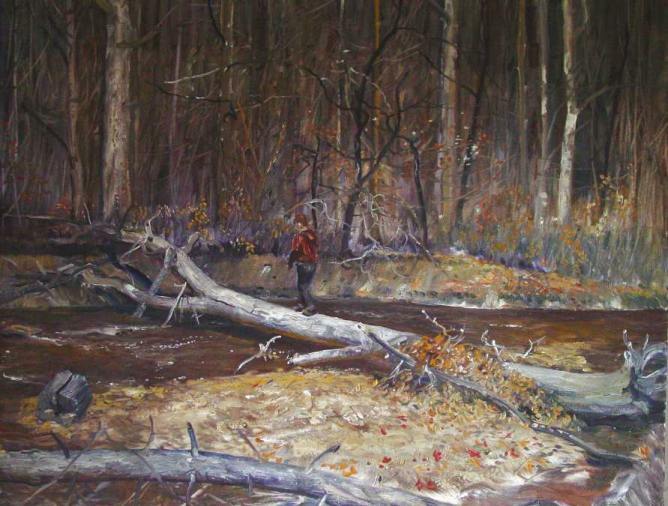 Painted 2015, February: Size16x20-inches on canvas: Pigments ground with ORIGIN Congealed Varnish; solvent technique. 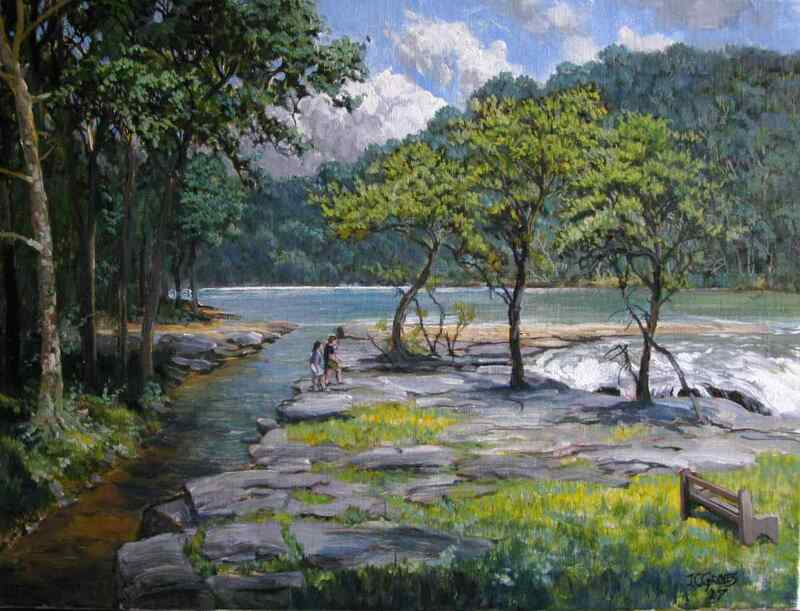 "Late Afternoon; The Swallow Falls near Oakland, Maryland" By James C. Groves. 24"x32": Canvas: Pigments ground with ORIGIN Congealed Varnish; solvent technique. 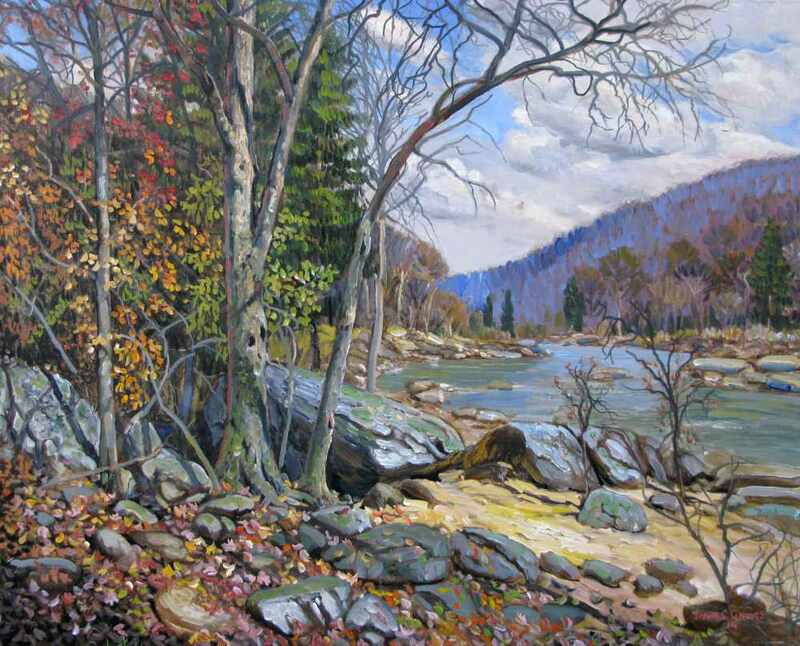 "Cheat River Gorge of West Virginia; Fall" By James C. Groves. 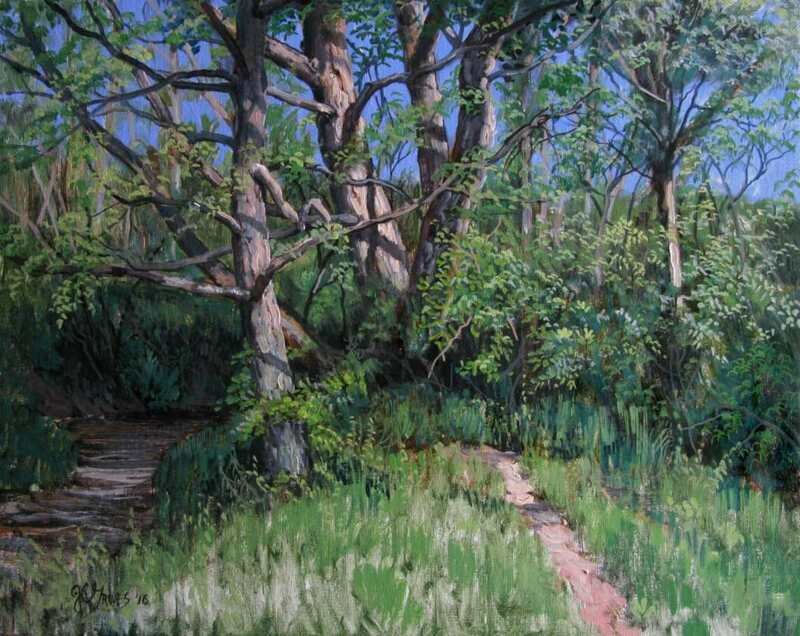 24"x32": Canvas: Pigments ground with oil then tempered with Cole's Copal Varnish; solvent technique. 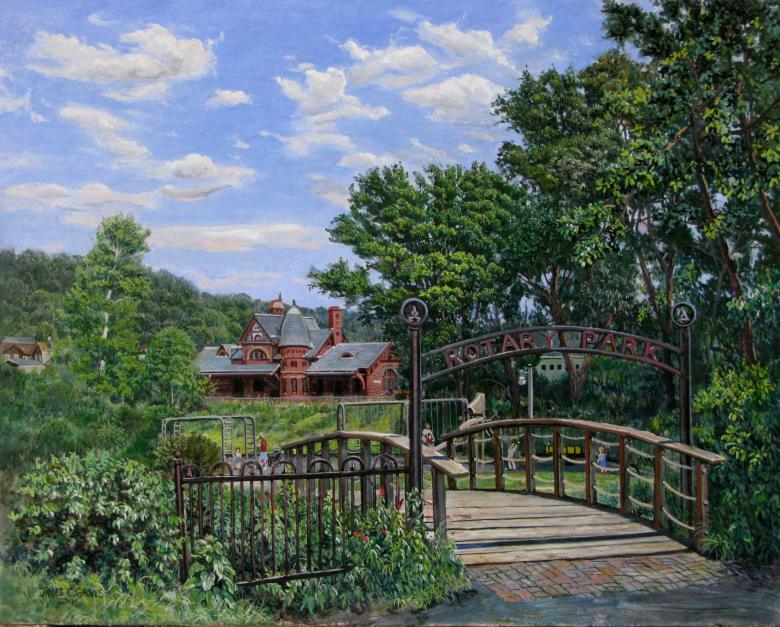 "The Fine July Day; Oakland, Maryland" By James C. Groves. 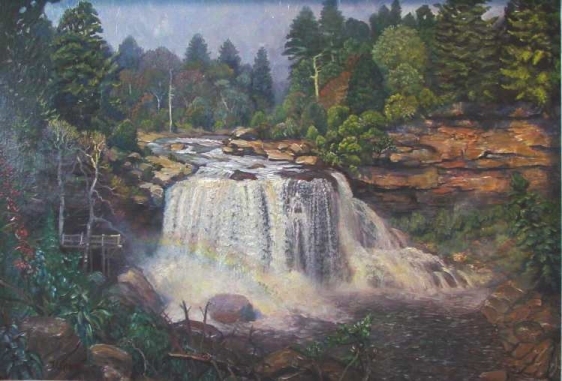 "Falls of the Black Water, West Virginia" By James C. Groves. 18"x24": Pigments ground with ORIGIN congealed varnish; solvent technique. 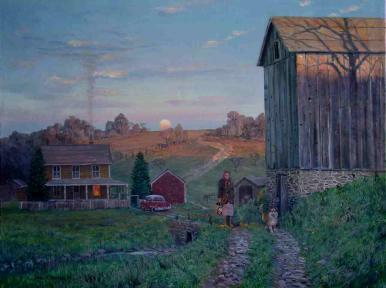 "Dinner at the Fireside; Oakland, Maryland" By James C. Groves. 16"x20": Pigments ground with ORIGIN congealed varnish; solvent technique. 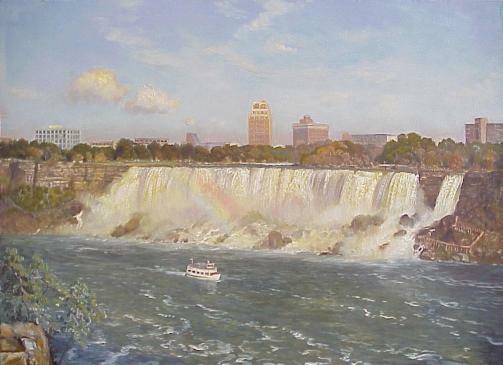 "Niagara; The American Falls" By James C. Groves. 24"x30": Pigments ground with congealed varnish; solvent technique. 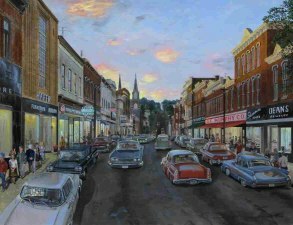 "Frostburg 1960; Center of the Earth"
"Cumberland; Baltimore Street- Thursday Night, November, 1955"
"Morning: The Swallow Falls of Garrett County, Md." 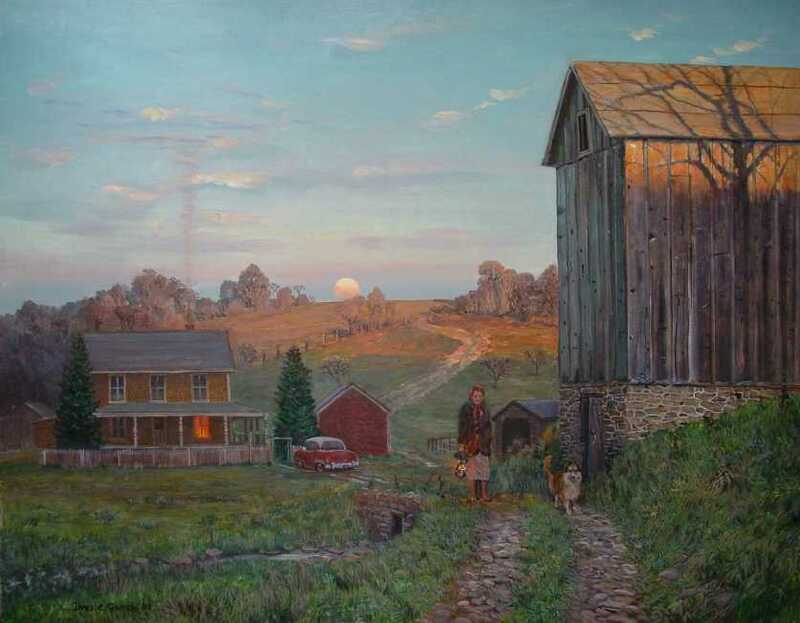 "Terra Alta Farm; May Morningt"
"February; Georges Creek at Dusk"
" Winter Dawn: The Emmanuel Episcopal Church of Cumberland, Md." 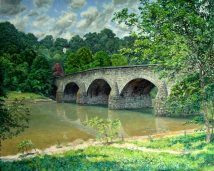 "Late August; National Bridge across the Conococheague River"
"Noon; Early August on the Conococheague River near Hagerstown, Maryland., 2005"
"Morning on the Mononga near Fairmont, W.Va; April, 2005"
"Frost in the Hollow, Little Patuxant River ; Early Morning, December"
"Yough River ; above the Ohiopyle Falls ; February"
"Warm and Cold, Blue and Gold"
"The Cheat River; July Afternoon"
"Mid-November; The Sycamores" AKA "The Fallen Sky"
"StatelineRR Bridge in the Narrows-1915 / this view is one of three original studies made for "Westgate" painting"
"Mid-Morning ; Blackwater Falls of West Virginia"
"Late Morning Light, Cliffside Above Potomac ; Fossil hunters, W. Md." 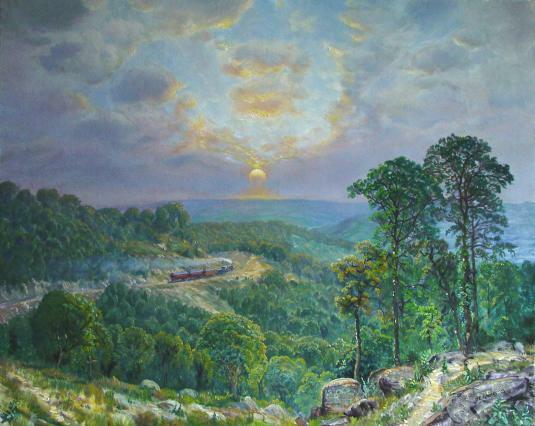 "The Western Md. 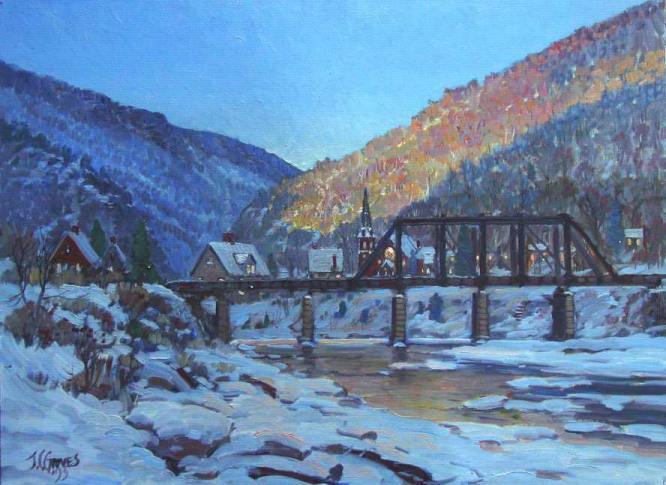 Scenic RR"
"Oil Study : The Narrows at Dusk"
"Tom's Bridge over the Little Patuxant River"
"Study : Cold Morning ;Strawberries for breakfast"
"Raspberry Picking ; The July Morning"
"The Rain has Ended; September Twilight"
"Nearly nightfall ; January Thaw"
"Mid-Morning Shadows ; January 1, 2004"
"The American Falls at Niagara- Evening"
Oil on canvas, 24x30 inches, framed in wide (4") beige wash on Gold Hudson River style wood frame.